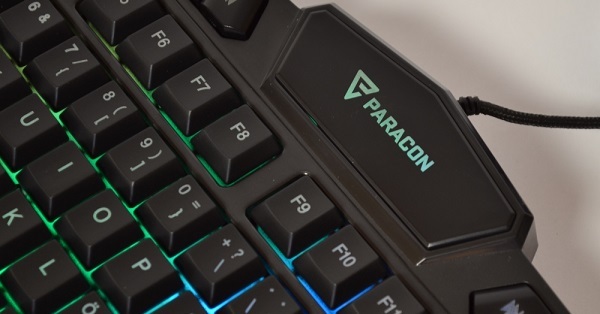 We have reached the last keyboard in the line of new products from Paracon. 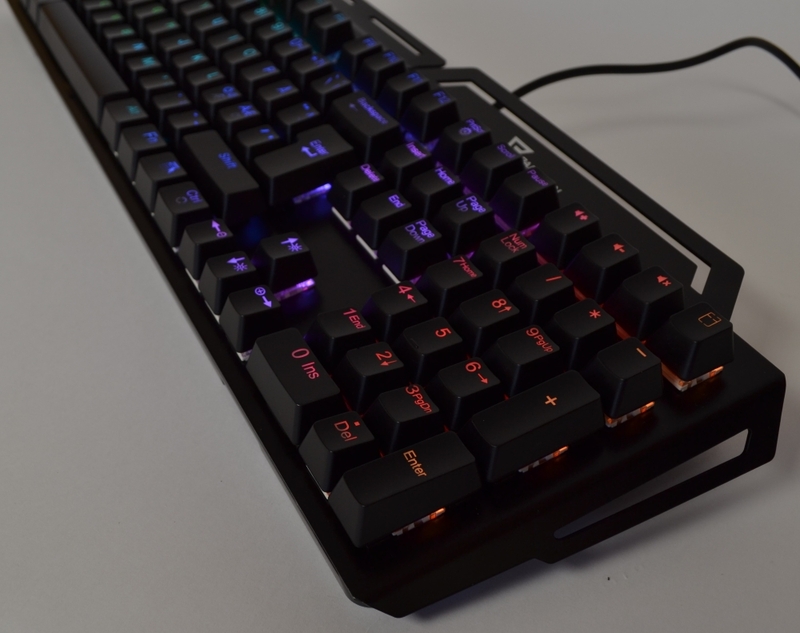 In this review we will have a look at their REBEL keyboard, which is a mechanical RGB keyboard. 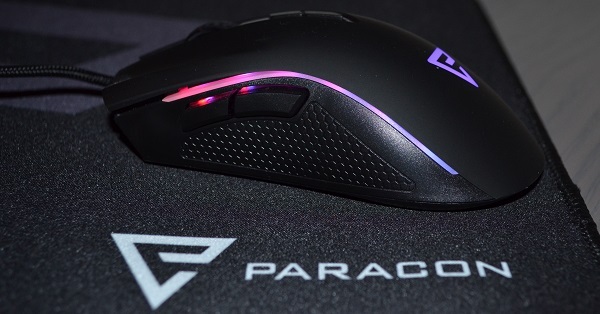 Paracon is a dedicated gaming brand that was founded in Denmark in 2016. 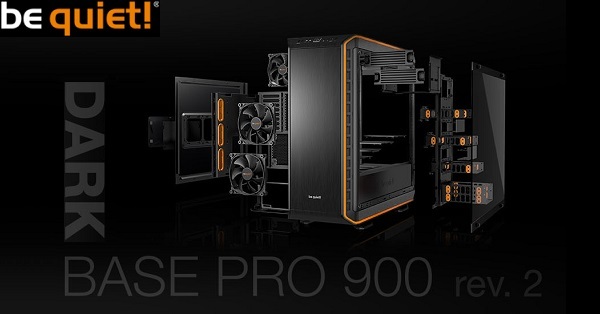 They develop a wide range of great gaming equipment, focusing on exceptional quality at a great price. Let's look at the packaging and the contents. As you can see, Paracon REBEL is delivered in a classic Paracon box. Black and white on the front and blue on the sides and on the back. There is a red sticker indicating that the keyboard has red mechanical switches. Inside the box, the keyboard is placed in plastic foam holders. There is a small user guide and the palm rest is located under the keyboard. Both products are protected by a plastic bag so that it is not scratched during transport. 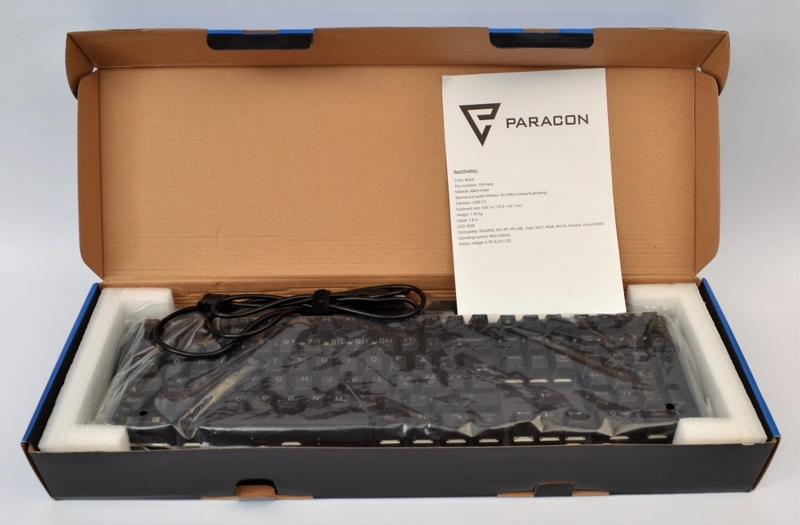 Paracon has chosen to use their own contacts in this keyboard, so you do not know who the manufacturer is. 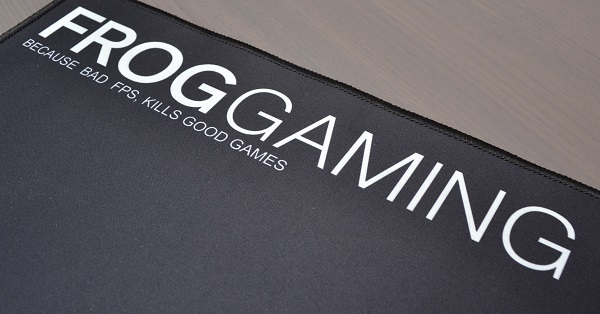 The keyboard is made of metal, has full anti ghosting and is plug'n'play. 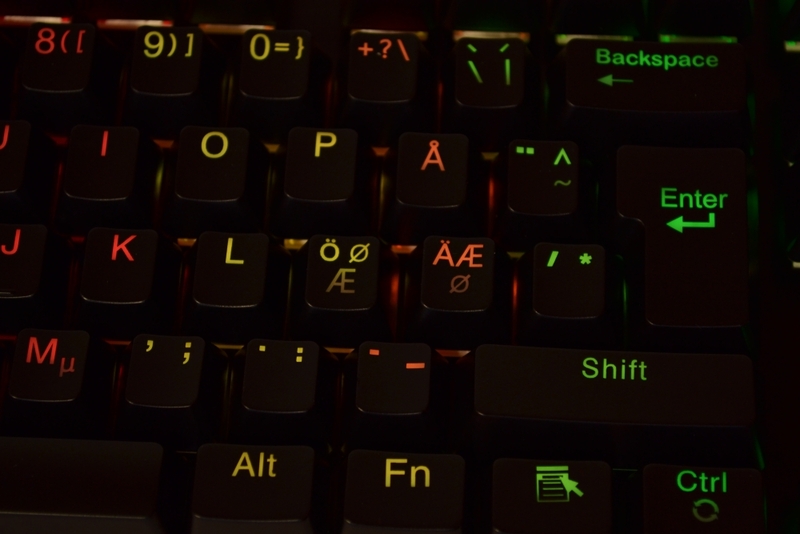 Besides that, the keyboard has the option of macro keys and it has 11 different light effects. Light: Paracon Lumos with fully adjustable light and 11 light effects. Macros: Possibility of 5 macros with up to 25 keys. Let us have a look at the keyboard. 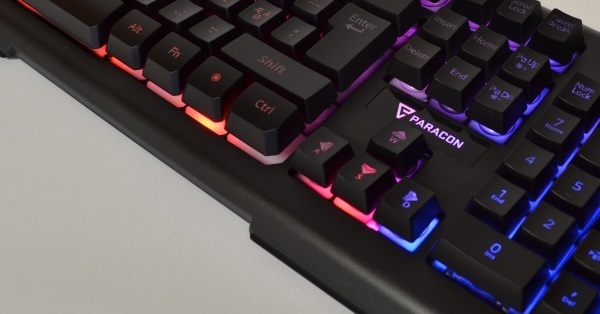 Paracon REBEL seems like a good solid keyboard from the first time you feel it. 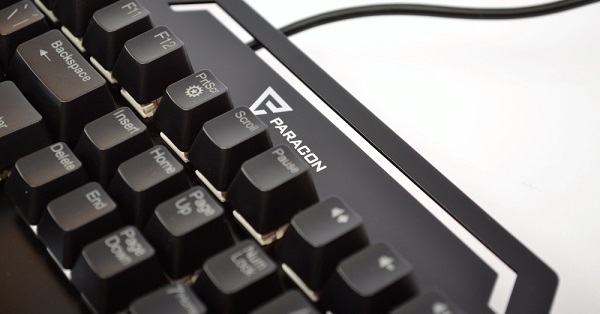 It is a classic mechanical keyboard, with pretty high keys on a metal base. The advantage of the palm rest is invaluable in my opinion. The keyboard has a standard layout on the normal part of the keyboard. However, the sharp eye will notice that there are extra keys above the numeric keypad. Here you will find some shortcuts to multimedia functions and to the calculator. It is great that you should not have to press several keys for these basic functions. 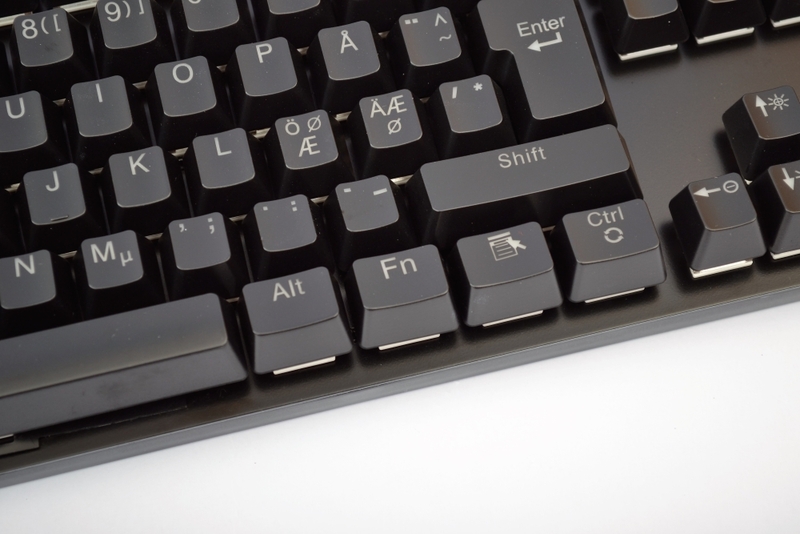 However, there is a Fn key, where among other things you control the light in the keyboard and some other functions. Since the keyboard is plug'n'play, there is no software for it. This means that everything works using keyboard combinations. This also applies to recording macro keys. You can of course lock the keyboard with a gaming function. This means, among other things, that the Windows keys are turned off, as well as some other keys. 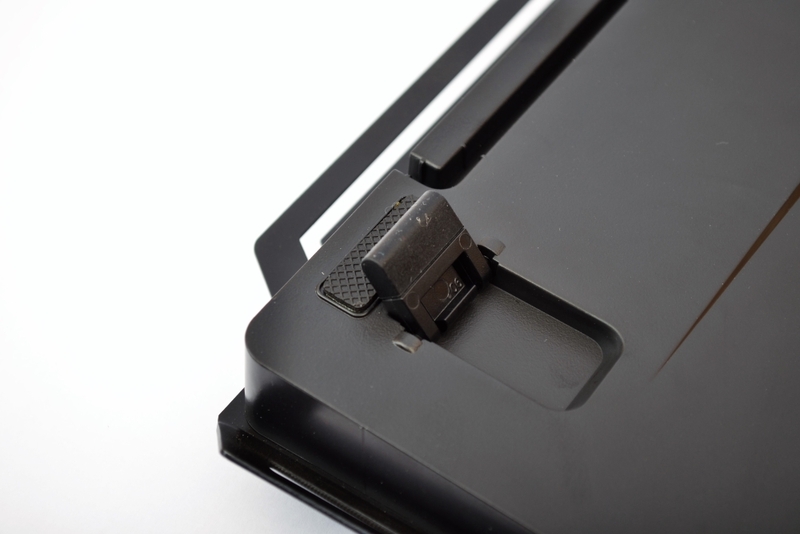 On the back of the keyboard we find some good rubber feet that ensure that the keyboard is firmly attached to the surface. The foldable feet also have rubber, so the keyboard is fixed even if they are folded out. The foldable feet give a higher angle to the keyboard. It is a personal opinion whether these feet should be folded in or out. But it's nice to have the opportunity. The wrist rest can be removed as needed. There are also rubber feet underneath it, so it also stands firmly. 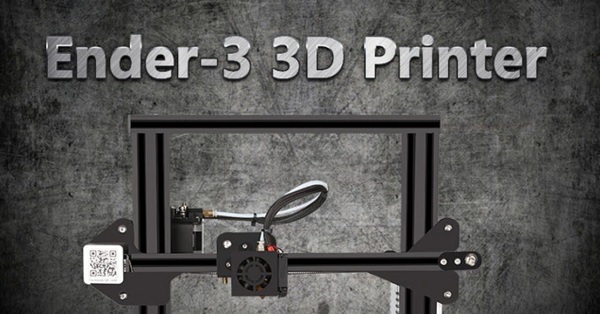 The support has a surface of structured hard plastic, which is good enough for most people. If you pull off the caps from the switches, you can see that it is red switches we have. They are transparent so the light can come out all the way around. 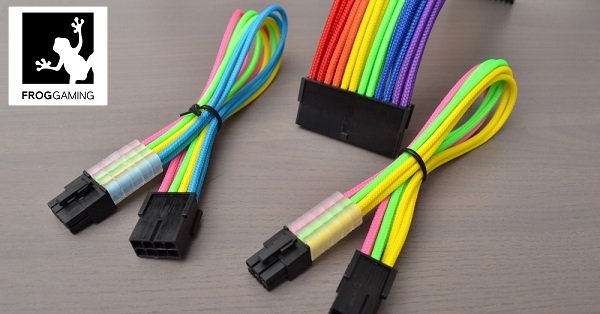 Finally, a picture of the 1.8 meter long cable made of pretty soft rubber. In fact, I think that is good. 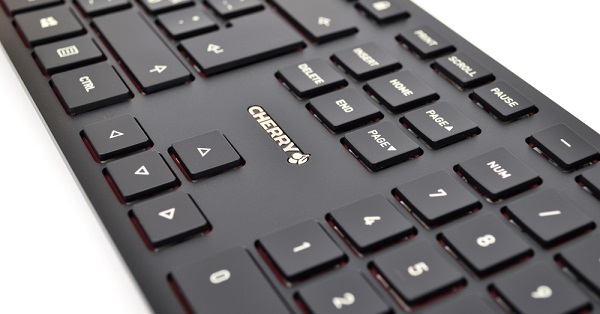 The very first time you get hold of the keyboard, you feel it is a good quality product. The weight is good and the surface in metal also makes it seem very robust. A good first-hand impression. The comfort of the keyboard is actually pretty good. You can angle it if you need to. 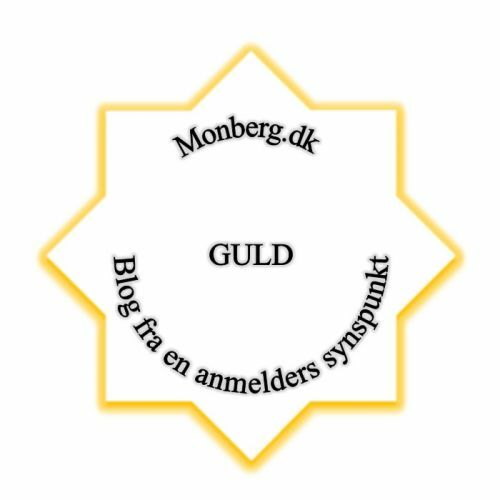 In this way you can get the writing position you desire. The wrist rest is also good to have when you have a fairly high keyboard that most mechanical keyboards are. 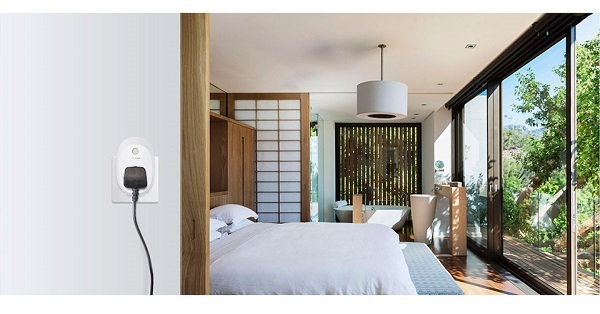 It also provides better comfort that you can rest while writing, without getting an uncomfortable angle in the wrist. 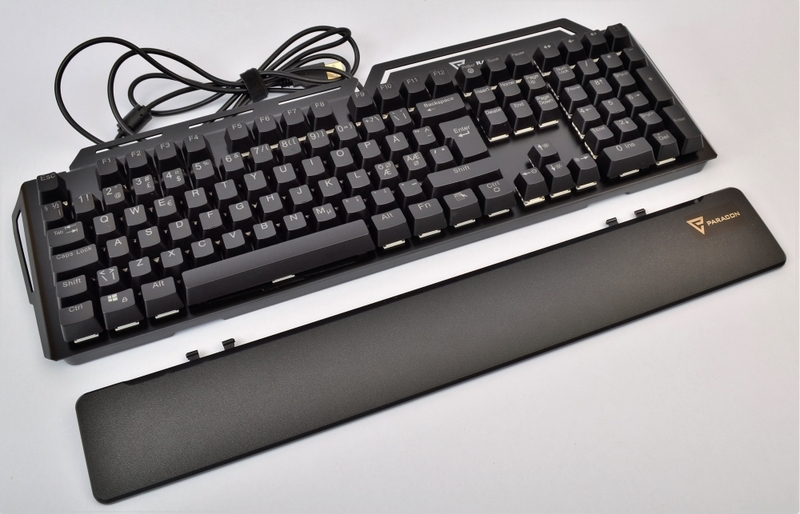 It's a mechanical keyboard we have here, which makes a lot more noise than a membrane keyboard. 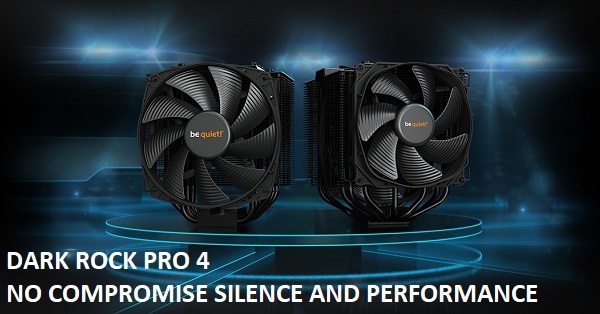 But I actually think it is quite quiet of a mechanical keyboard to be. 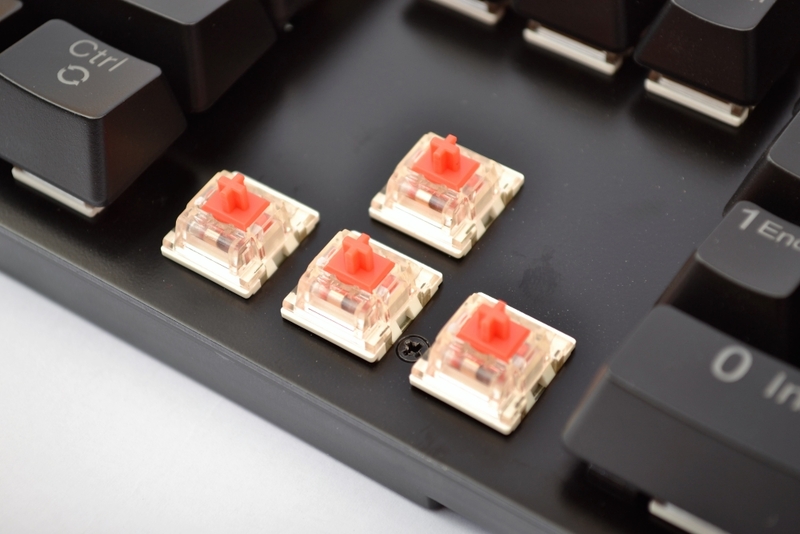 It has the classic hard bottom when you press the keys all the way down, and then the actual movement in mechanical keyboards also makes some noise. 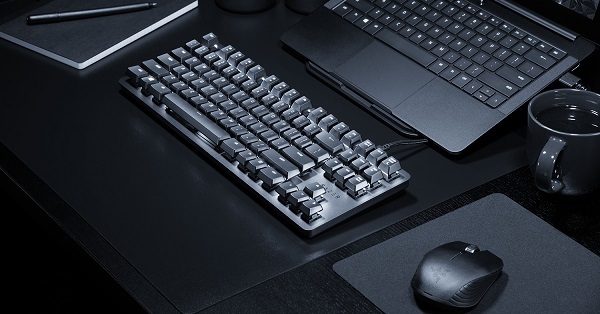 This keyboard seems to make less noise than many keyboards that I have heard from other manufactures. 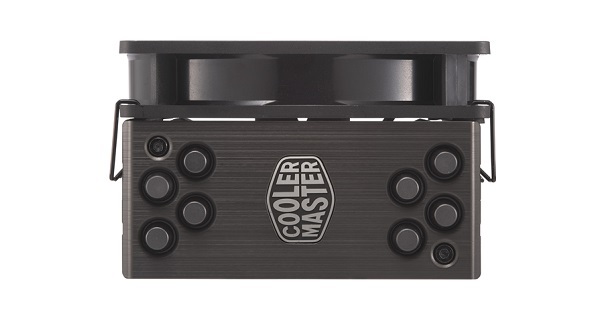 All in all, it has a good noise level when talking mechanical keyboard. The light in Paracon REBEL is quite nice and appropriate. It is full of effects that give a lot of life when typing. The lock functions are white when they are activated, so scroll-, num- and caps-locks are white when activated. 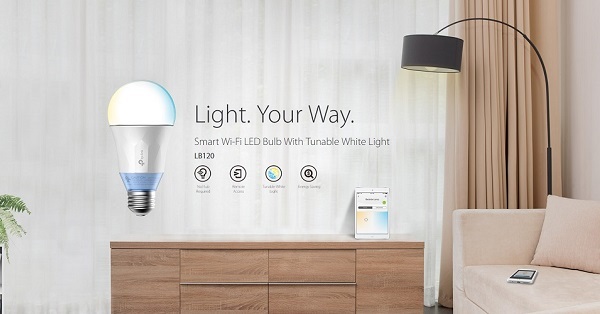 You can also record your own light setting in the same way you can record macro settings. 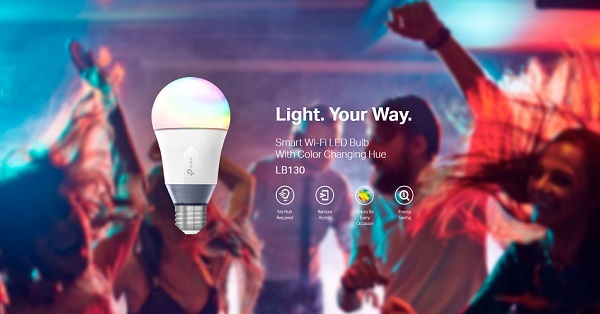 If I have to mention something about the light itself, then it would be that you cannot choose a setting without effect, so there are no static colors. Another thing I can mention is that it does not save the last setting in the light, so you have to set it every time you sit down at the computer. However, it is super fast and easy with the hotkeys you have available. And then you can create a macro for it, so you only have to activate a macro to set it all. So basically it's not a huge problem. What is my opinion of Paracon REBEL. 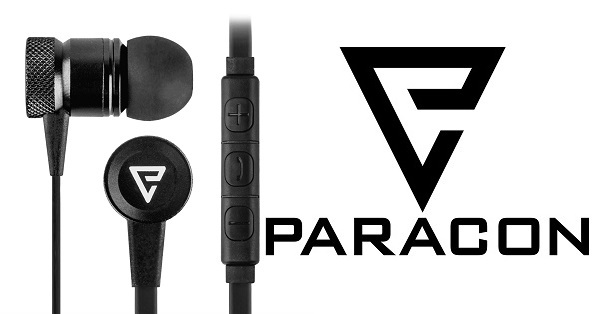 Paracon has actually made a great product. 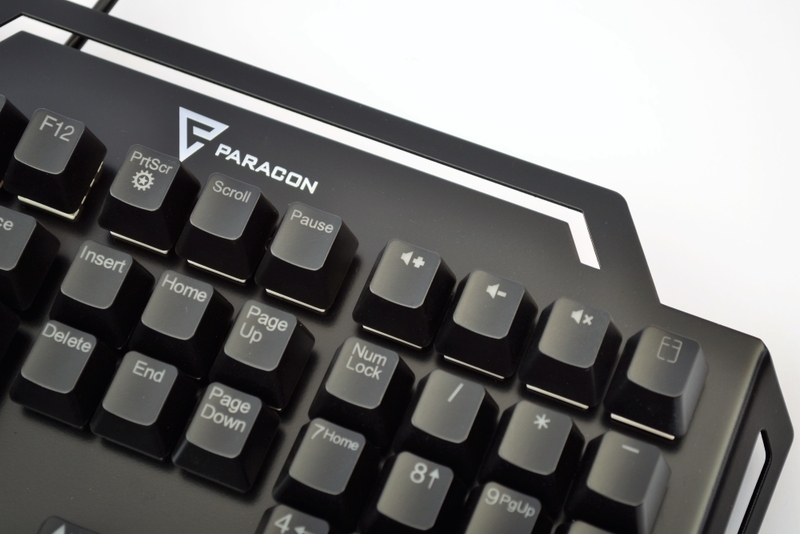 It's one of the best keyboards I've tried when talking quality and performance. The contacts respond promptly and you are sure all keystrokes come through with 100% anti ghosting that this keyboard has. 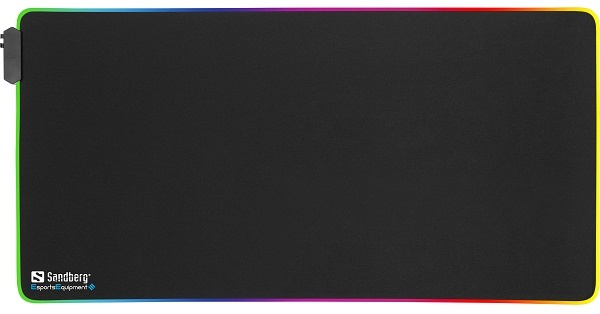 The wrist rest and comfort are also top of what you can expect from a keyboard in this price range. You can rest your wrist and write at the same time without problems, as the wrists are raised above the surface. I really like the principle that this keyboard is Plug'n'Play, so you don't have to install drivers to make it work. 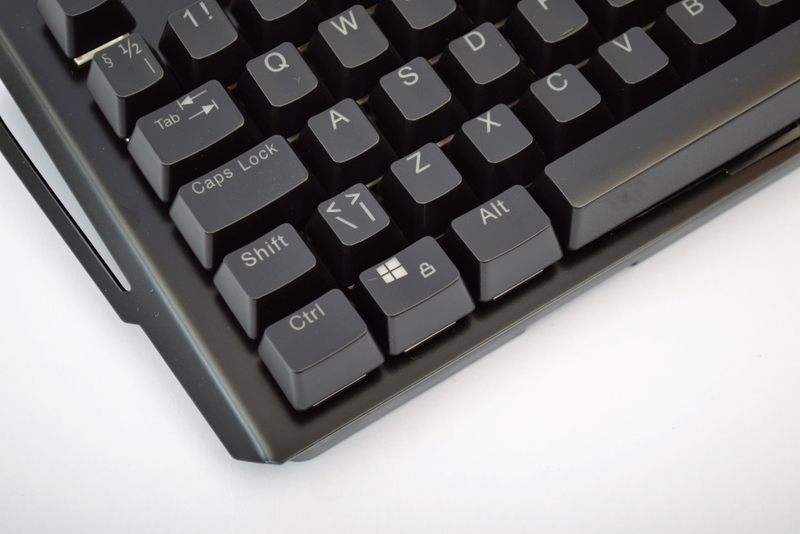 You set it all by fast and easy keystrokes on the keyboard itself. And to be honest, how often do you sit and adjust driver software when you found the settings you want? There are also a few bad things I've found. Among other things, the light resets itself when the keyboard is restarted. It can be a bit annoying until you get used to it. Because if we are to be honest, then everything is a matter of habits. However, I have informed Paracon about this and they are aware of this for a future upgrade. After all, it's all a matter of price. 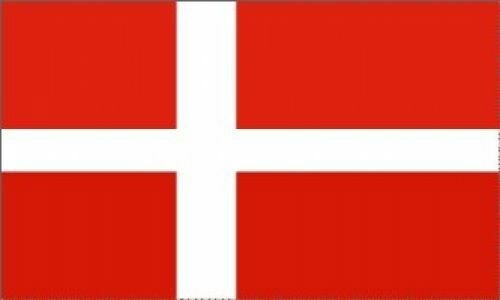 The price of Paracon REBEL is just under DKK 400 at the time of writing, which is a great price. 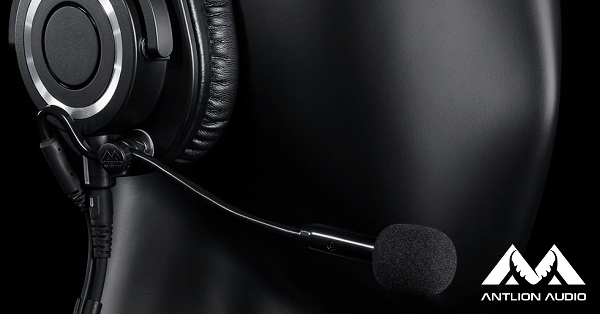 You get good quality for your money and a product full of features. All together, I want to give this keyboard a nice GOLD star. The value is very good with the product you get and the quality seems at the very top.